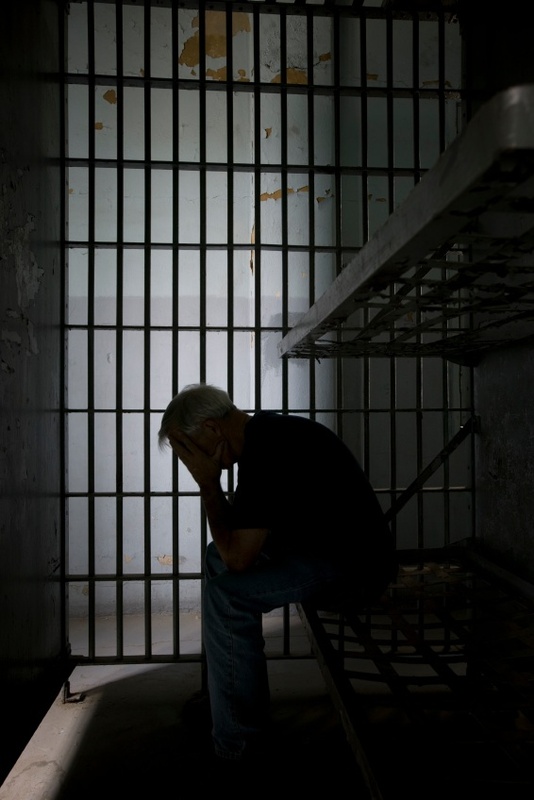 Solitary confinement not only is clearly categorized among torture methods, but also, as a severe stressor, eventually leading to post-traumatic stress disorder (PTSD) and suicidal behaviour. 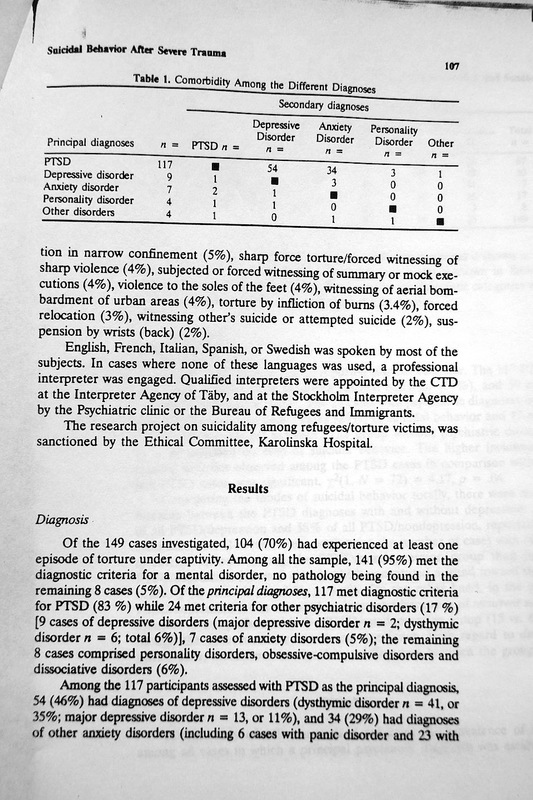 In the sample studied, prisoners with PTSD caused by imprisonment in a solitary cell, suffocation or detention in narrow confinement, developed suicidal behaviour associated with hanging or asphyxia. 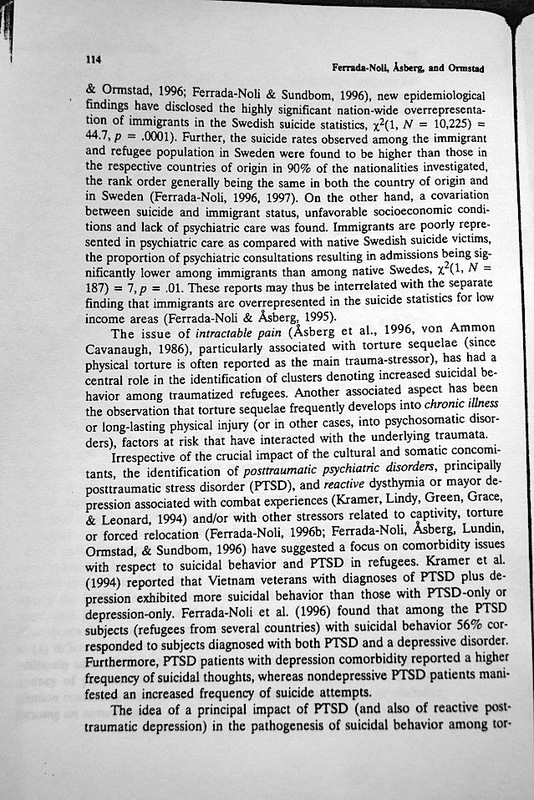 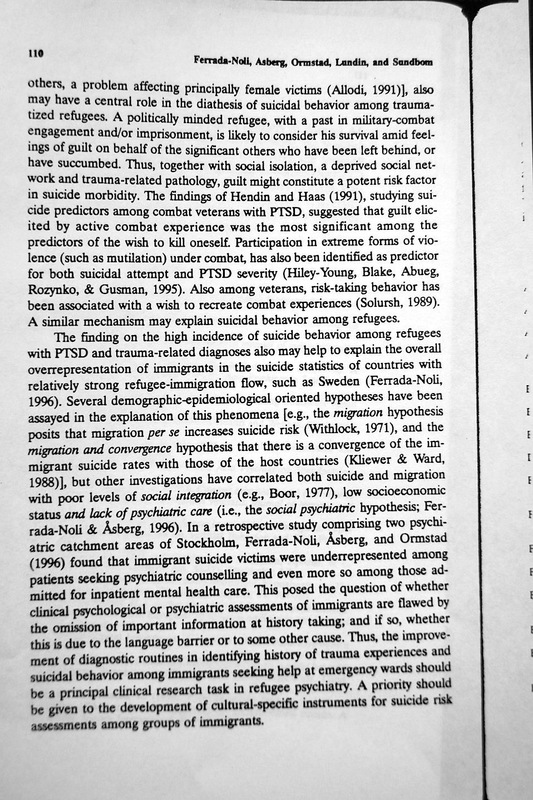 I published these findings (papers 1, 2, ) in Journal of Traumatic Stress, and (paper 3, down below) in the Swedish Medical Journal, Läkartidningen. 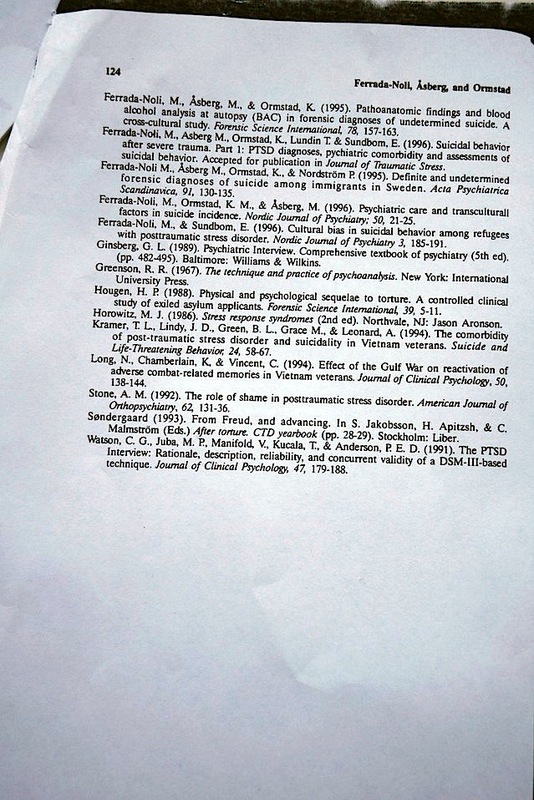 The findings have been confirmed in peer-reviewed scientific papers. 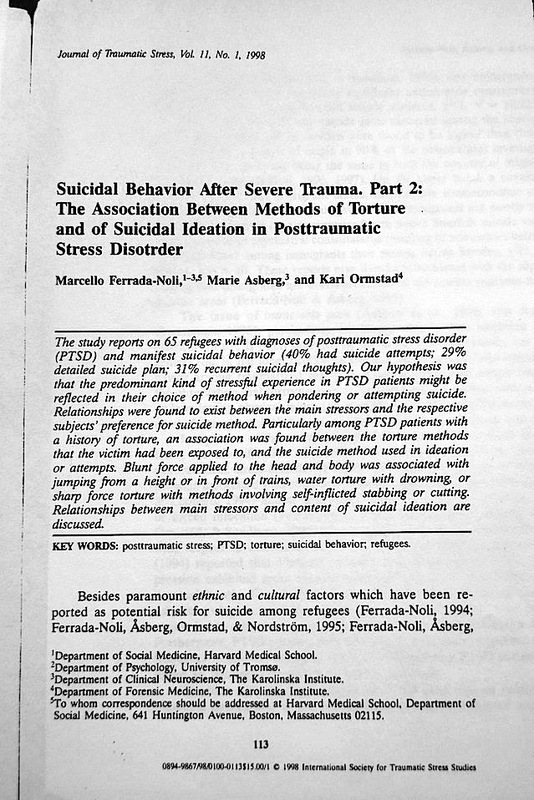 I am sharing these research findings that I published, together with a group of scientists, in the Journal of Traumatic Stress. 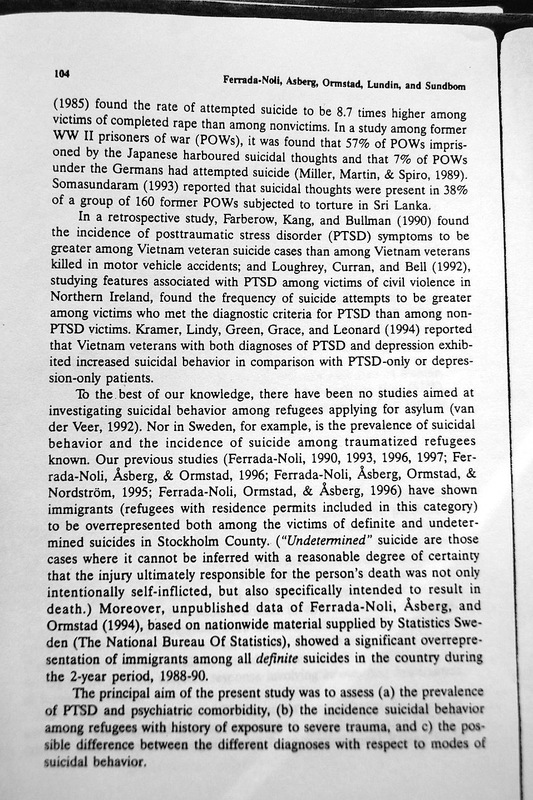 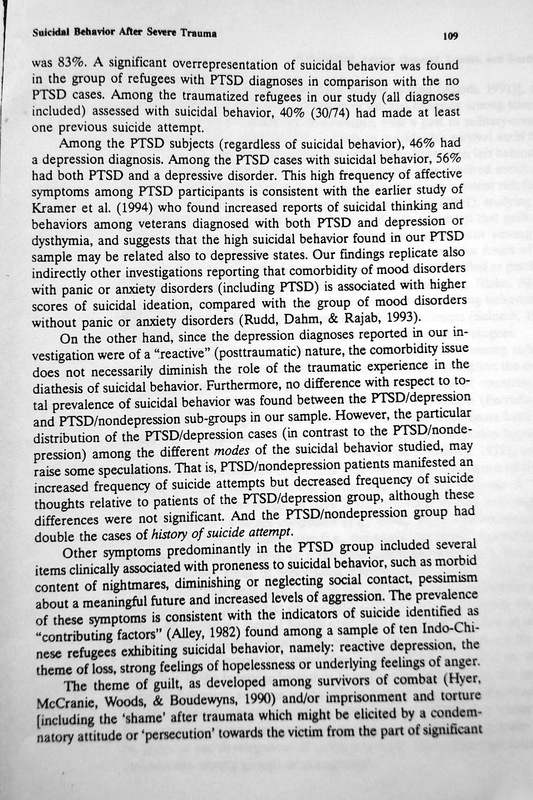 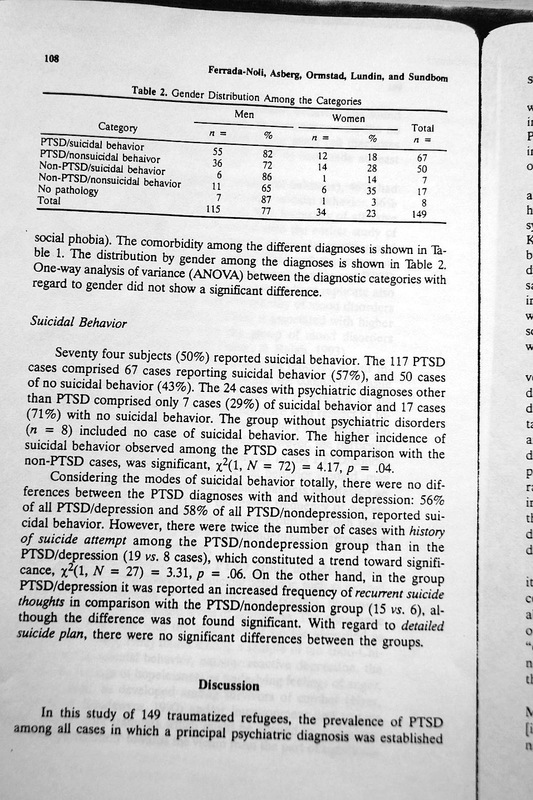 These are part of a series of traumatic and suicide related findings I published while in different research commitments at Harvard Medical School between 1997 and 2000. 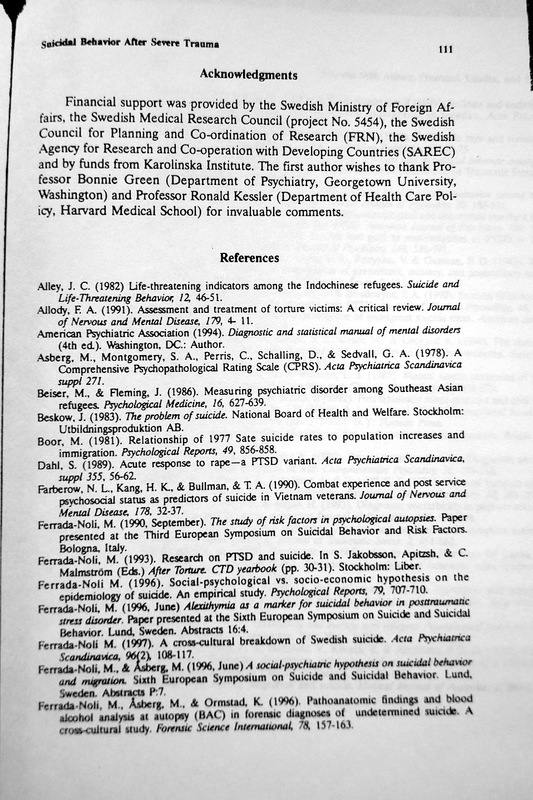 Mainly as Harvard Research Fellow and Lecturer of Social Medicine. 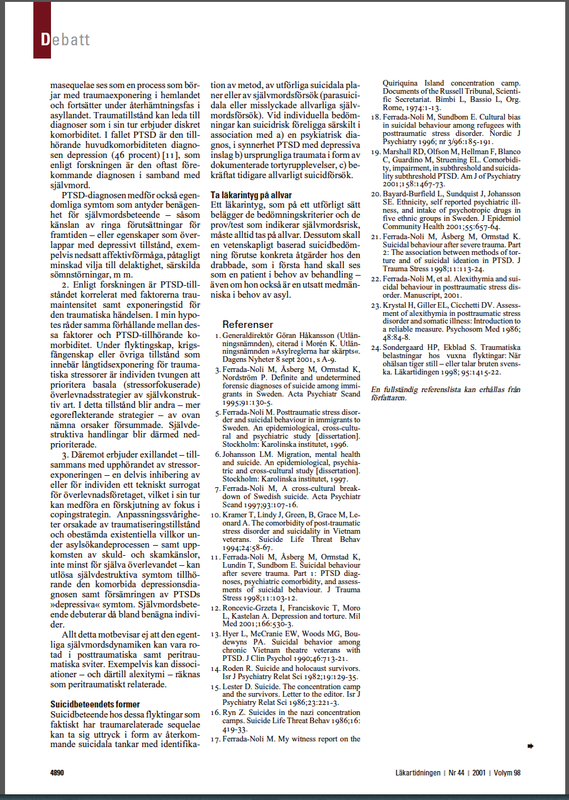 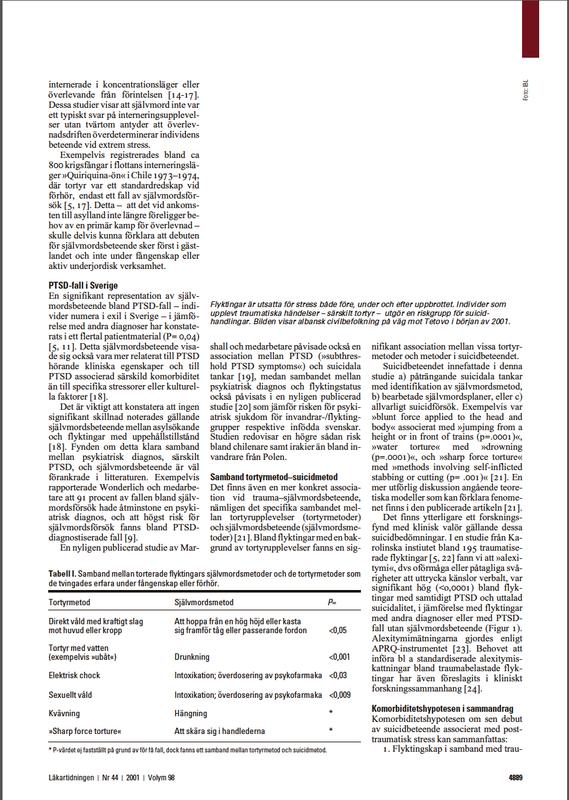 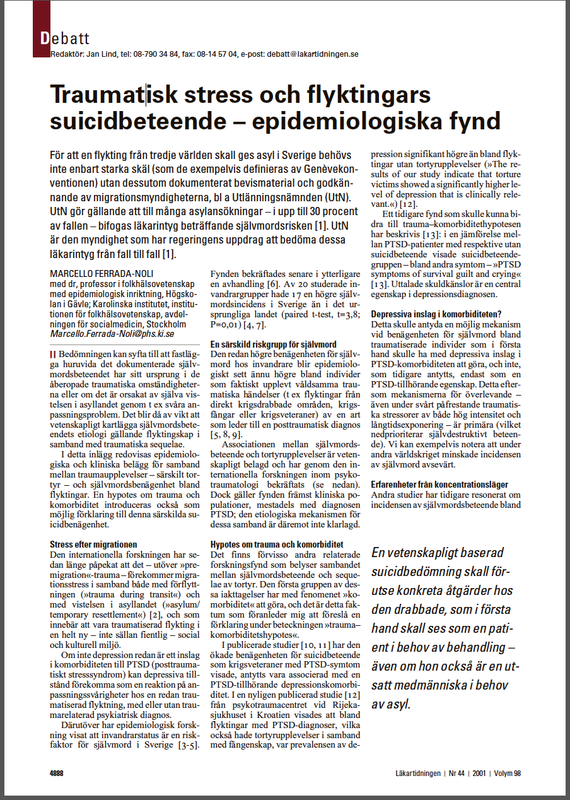 I have also added an article published in the Swedish Medical Journal (Läkartidningen). 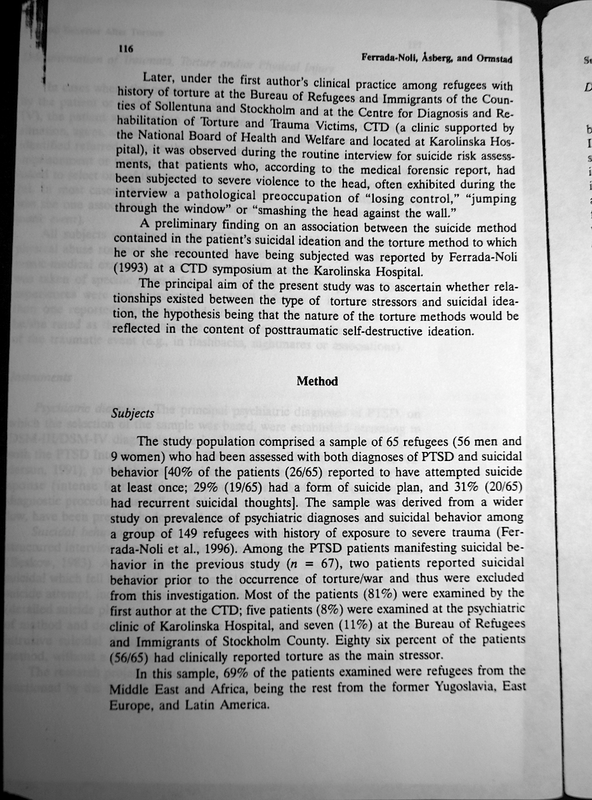 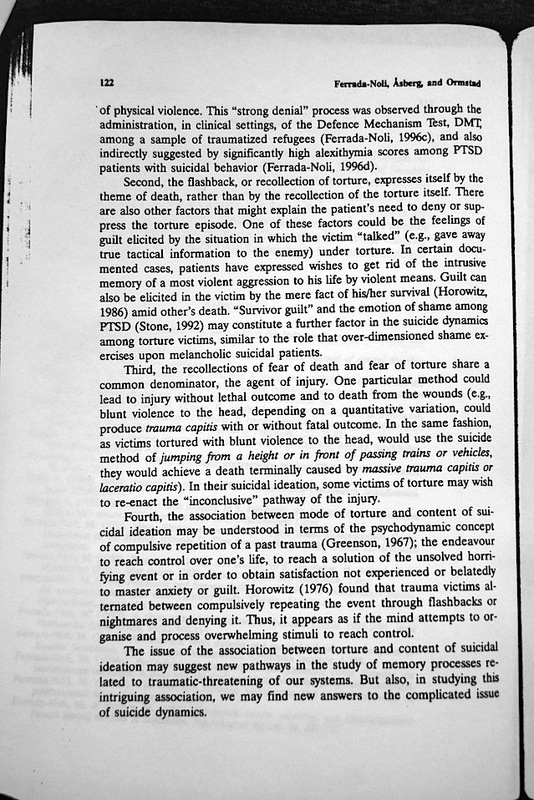 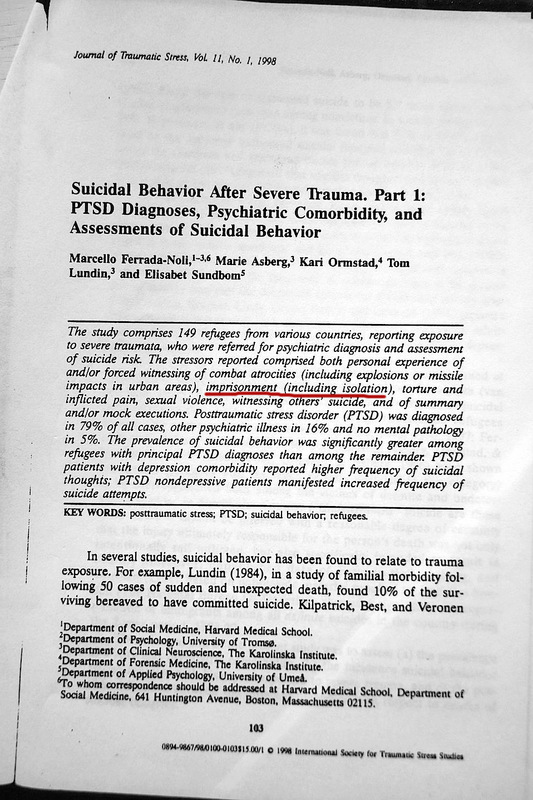 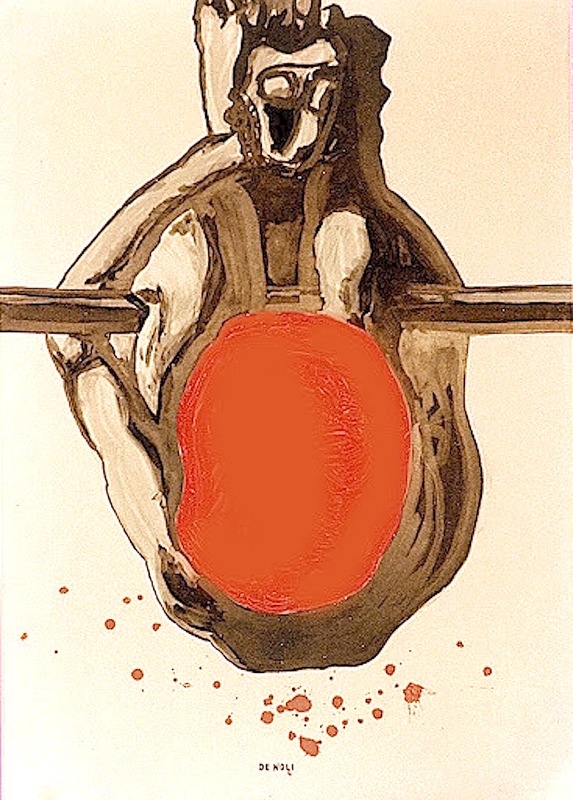 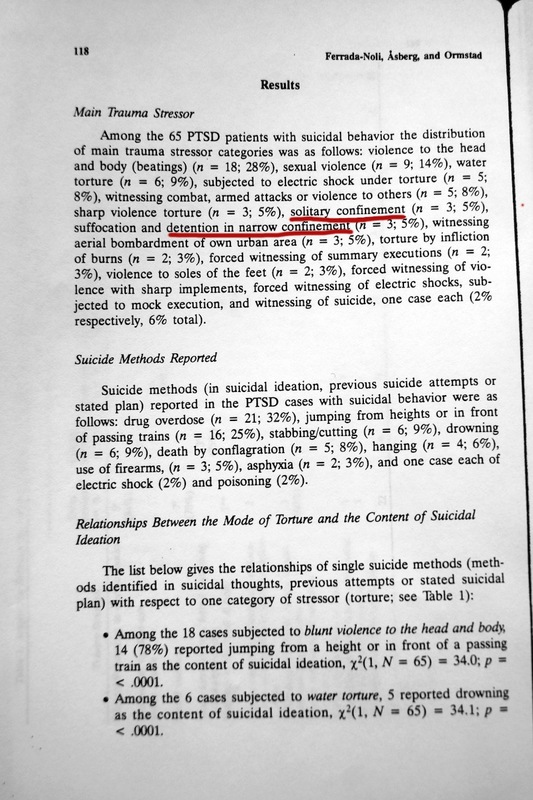 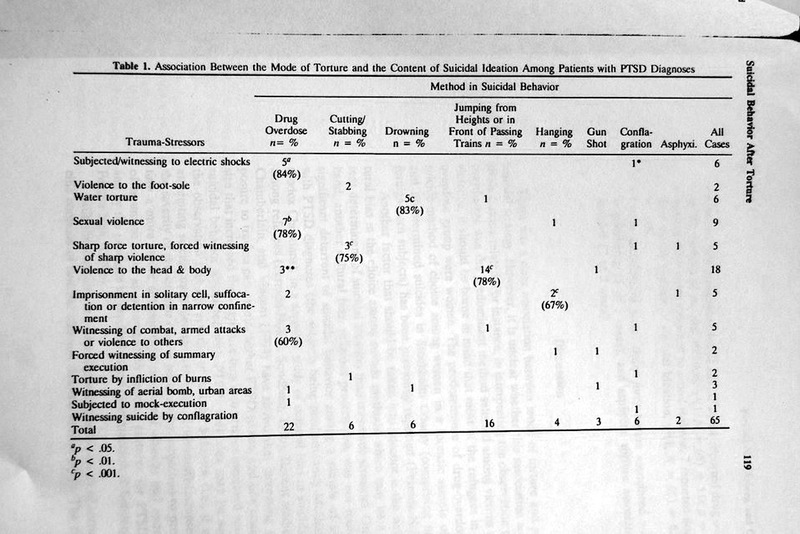 These clinical psychiatric discoveries published in the world leading journal on psychic-trauma related research, edited in the US, show that solitary confinement not only is clearly categorized among torture methods, but serving as severe stressor, eventually leading to post-traumatic stress disorder (PTSD) and suicidal behaviour. 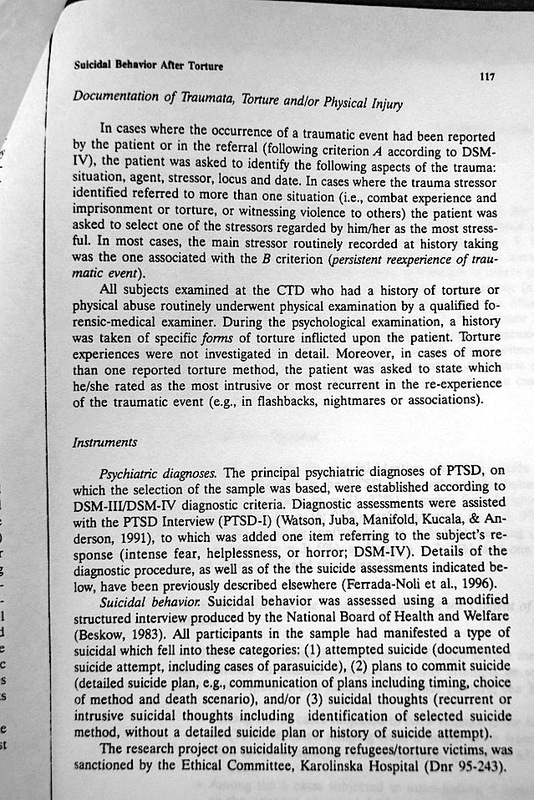 I wish to emphasize that these discoveries were done with the collaboration of internationally known scientists in the fields of clinical psychiatry, forensic pathology and traumatic stress. 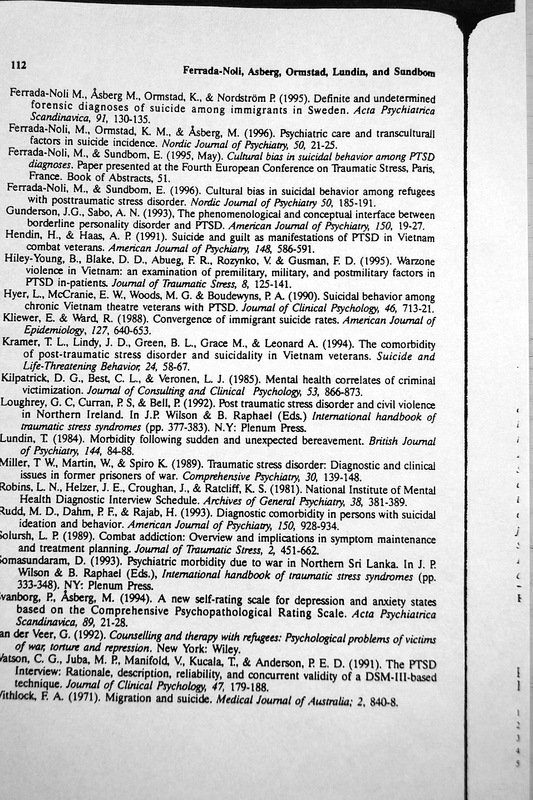 Among others Professor of Psychiatry Marie Åsberg (formerly chairman of the Nobel Assembly at the Karolinska Institute, and precursor of the world known Serotonin discoveries in association with depression and suicidal behaviour (5-HIAA in the cerebrospinal fluid as biochemical suicide predictor), Professor of Forensic Medicine Kari Ormstad, Norway, and Professor of Psychology Elisabet Sunbom of the University of Umeå. 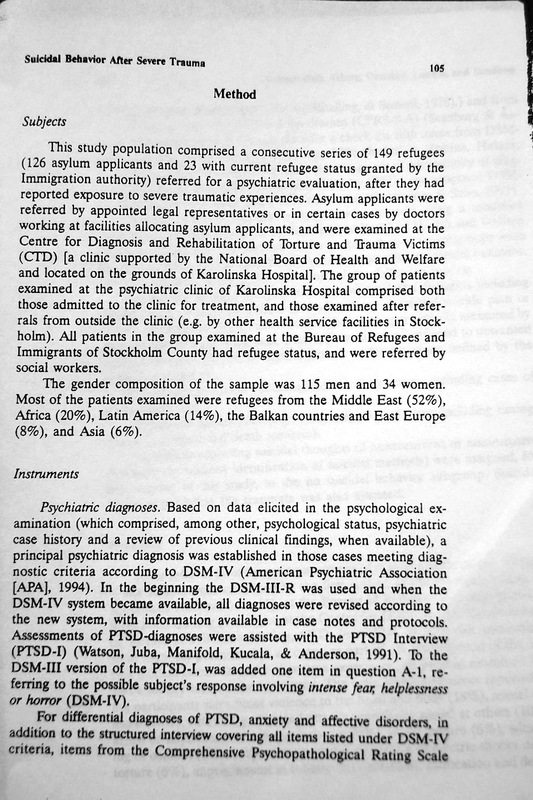 I have devoted much of my professional life-span after to study these phenomena among former political prisoners. 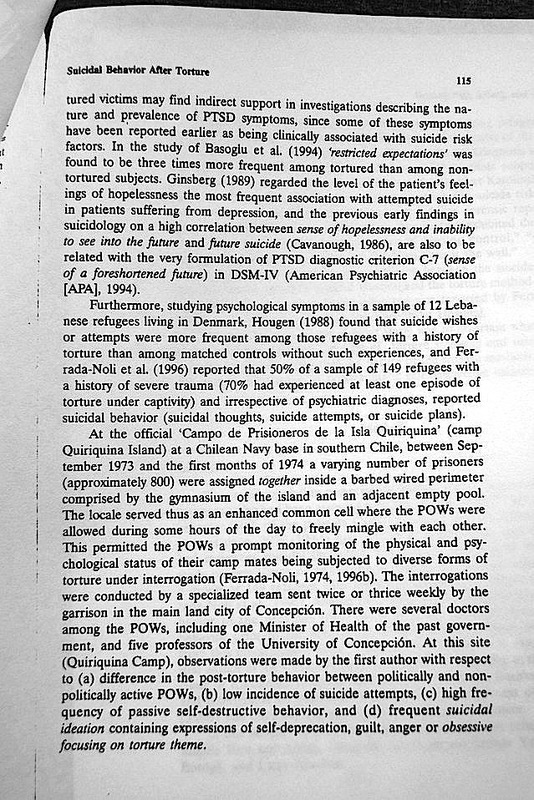 I have myself been witness to these traumatic events inflicted on hundreds of prisoners in the Prisoners Camp of Quiriquina Island, The Football Stadium and in the Detention and Torture Centre set up 1973 by Pinochet’s Marine Corps in the Borgoño Garrison in Concepción. 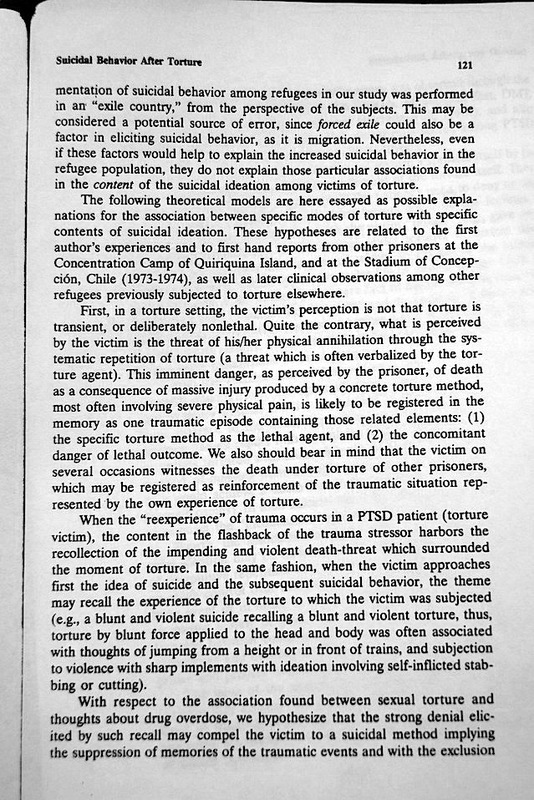 Personally, my first experience in a solitary cell had occurred earlier in August 1969, after a detention warrant issued by the Christian Democratic government of President Eduardo Frei against 13 leaders of the (by Pinochet called) “Terrorist” organization Movement of the Revolutionary Left (MIR) [El Mercurio, “A Través de la Historia Terrorista del Movimiento de Izquierda Revolucionaria”, 23/7/1973]. 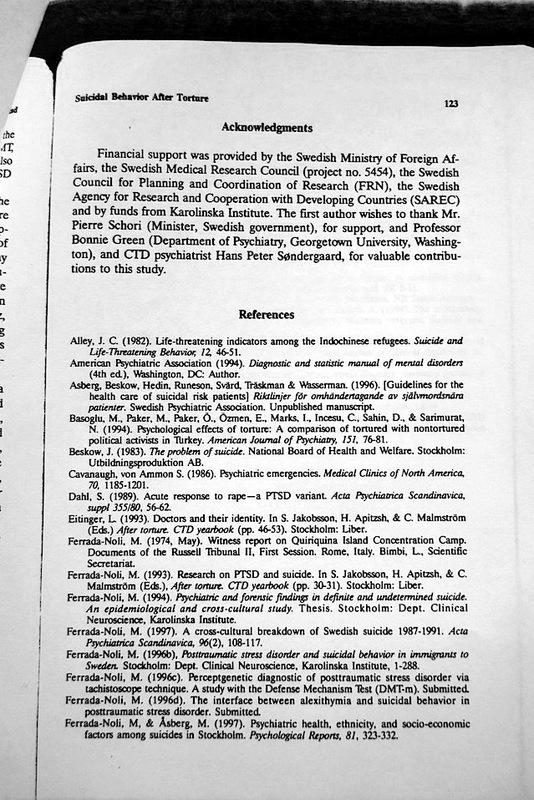 I began to write on human issues in the Swedish “case” against the WikiLeaks’ founder Julian Assange, precisely after I read the news in Italy that he had been confined in a solitary cell in London, caused by a warrant nominally issued by the Swedish authorities. 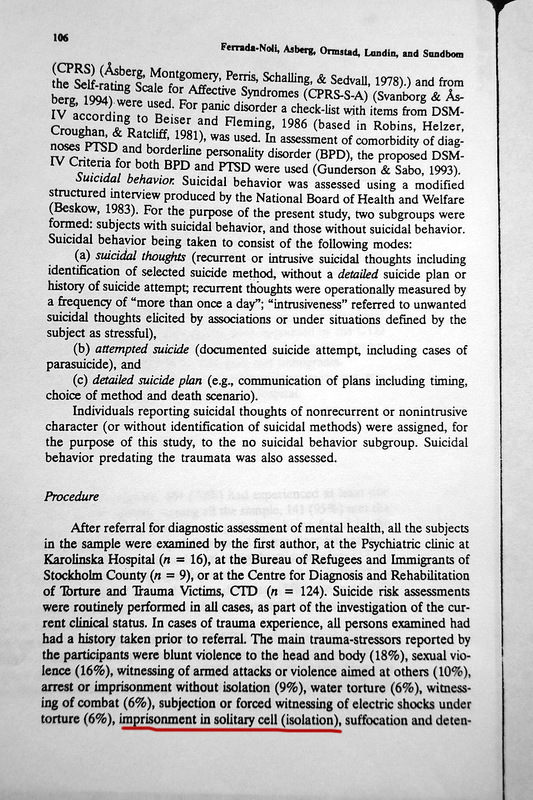 The “case” showed out being of purely political nature. 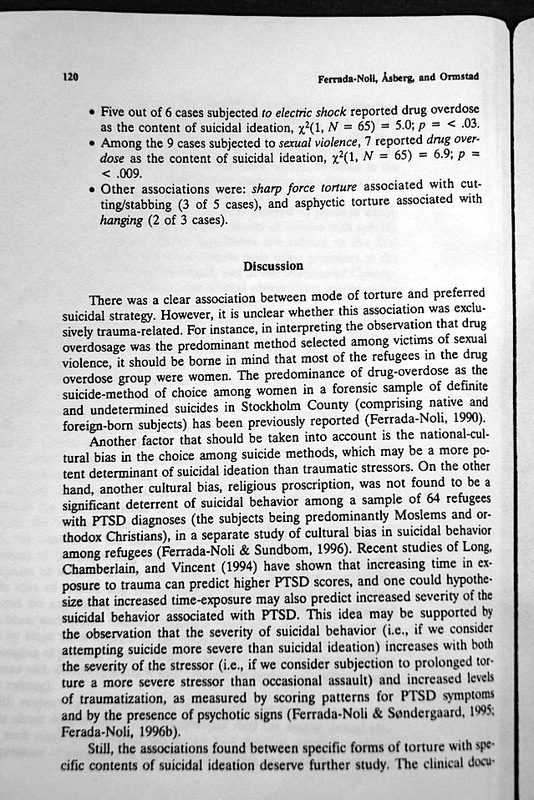 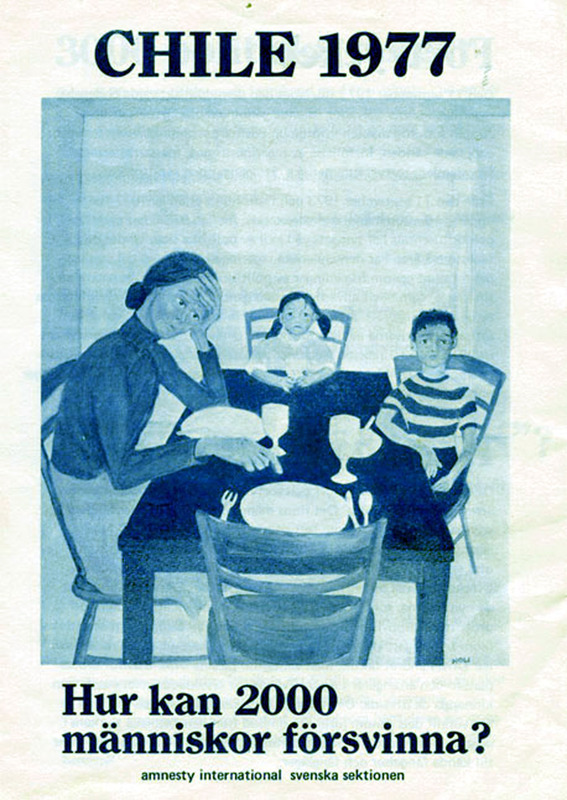 >The contribution of ethnic discrimination to suicide.